An outstanding Latin American conductor, Sergio Bernal has earned international recognition as a "tasteful technician with a more than technical gift for connecting with a score’s essence." His debut appearance at New York’s Lincoln Center was considered "admirable... Balances were exemplary; attacks and releases precise and explicit; and the sultry atmosphere well conveyed". A native Colombian, he studied on a full scholarship and stipend with Lorin Maazel, Günther Herbig, Erich Leinsdorf, and Eleazar De Carvalho in the Yale University/Affiliate Artists Conducting Program. He also holds music degrees from Queens College and the University of Michigan, where he studied with Gustav Meier, and won conducting scholarships at the Aspen Music Festival and the Tanglewood Music Center. In 1986, he became an assistant to the late Eduardo Mata and since then worked closely with him in recording projects of the Ibero American symphonic repertoire. 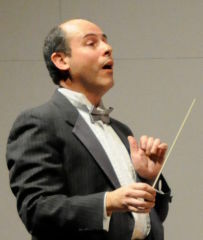 Mr. Bernal’s engagements include appearances with the Simón Bolívar Orchestra of Venezuela, the Orquesta Sinfónica Municipal de Caracas, the National Symphony Orchestra and the National Opera of Mexico, the National Symphony Orchestra of Colombia, the Bogota Philharmonic, the Torun Chamber Orchestra and the Szczecin Opera of Poland, the W.A Mozart Philharmonic of Rumania, and the Indianapolis Chamber Orchestra. He also gave outreach and family concerts with the Dallas and the New World Symphony, and was a cover conductor for the Detroit Symphony Orchestra and the New World Symphony (tours to South America and Costa Rica). Since 1993, Mr. Bernal has worked closely with the National System of Orchestras of Venezuela. There he has served as a permanent guest conductor and artistic advisor for the System, and as music director of the Mérida Symphony Orchestra. In 2000, he led the Orquesta de Juventudes de los Países Andinos in its tour to Bolivia, Colombia, Ecuador, and Perú. In 2001, he recorded a 2-hour instructional video on Orchestral Conducting, to be used within the educational programs of the System of Orchestras in Venezuela and other Latin American countries. Sergio Bernal currently directs the Utah State University Symphony Orchestra, an ensemble that is achieving, under his leadership, important levels of development. Mr. Bernal is also the Director of Strings of the Music Department, and works closely with the Fry Street Quartet in building and implementing programs geared towards helping the students develop their abilities to the maximum of their potential. In addition to his conducting and teaching activity, Sergio Bernal is a composer of orchestral music. His works include a Violin Concerto and “Sonancias para Cuerdas”, both of them inspired by music and musicians from Latin America. Mr. Bernal is currently a candidate for the Doctor of Philosophy in Music Composition degreee at the University of Utah, where he studies with Morris Rosenzweig, Miguel Chuaqui, and Steve Roens. He has also worked as a record producer for the Dorian Label with artists such as pianist Samuel Sanders, violinists Rachel Barton and Ulrike Anima Mathe, and the Latinoamericano and Lafayette String Quartets.